Cutting edge Dance Drum loops. Back in 1997 Airwave released his first records on the infamous Bonzai Label. His countless productions under 35 different aliases (Airwave, Body shock, Cape Town, Planisphere, Fire & Ice, Nova, The Green Martian, Lolo, Cloud 69, Meridian) got him plays by the biggest dj’s on this planet, including DJ Tiesto, Armin van Buuren, Paul Oakenfold, Ferry Corsten, Judge Jules, Sasha, John Digweed, Chris Fortier, and Seb Fontaine. So much respect from his fellow colleagues, led him to collaborate with several artists, including Armin van Buuren, Tiesto, M.I.K.E aka Push, Judge Jules, and lately Markus Schulz, Above and Beyond, Andy Moor, and many, many others. Airwave has created an exclusive collection of beats and breaks from samples in his personal collection and he has created a sublime collection of some of the most cutting edge Dance Drum loops which will suit all styles of music from Downbeat through Breaks, House, Trance, Techno and also Minimal and Electro styles. 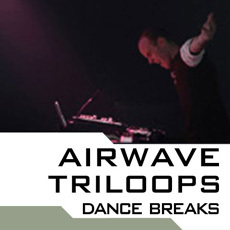 With tempos from 60 - 140 Bpm you can see that Airwave has covered many bases with this collection although the majority of the loops can be found at tempos between 125 - 132 which suits House, Trance, Techno and Breaks particularly well.